Is there a better alternative to Code Barre X? Is Code Barre X really the best app in Applications category? Will Code Barre X work good on macOS 10.13.4? 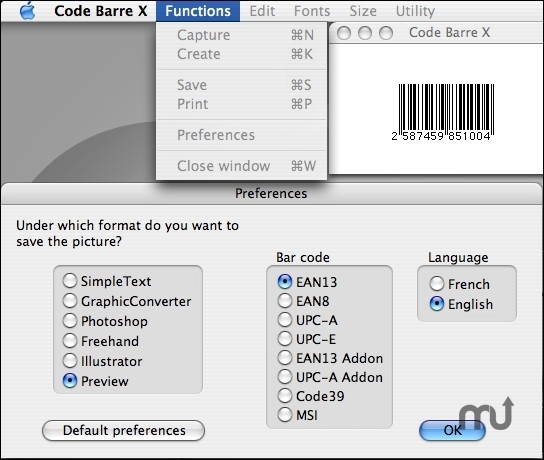 Code Barre X allows you to draw, create, and save the bar codes EAN13, EAN8, UPC-A, UPC-E, EAN13 Addon and UPC-A Addon (Addon : 2 or 5 additional digits), Code39, ISBN, MSI. You can chose font, size, and picture format for the save of the drawn bar code and the type of bar code. This software is in French and English. deletion of a bug: sometimes, a wrong barcode was generated for EAN13 Addon 2 for EPS picture. deletion of a bug: sometimes, a wrong barcode was generated for UPC-A Addon 2 for EPS picture.